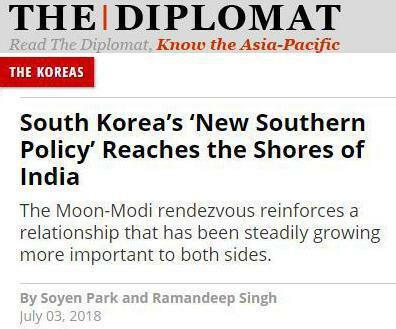 7월 3일자 미국의 외교안보 전문지 디플로마트는 “South Korea’s ‘New Southern Policy’ Reaches the Shores of India” (한국의 ‘신남방정책’, 인도 해안에 도달하다) 라는 제목으로 문재인 대통령의 인도방문에 관한 기사를 다루었다. 기사는, 문재인 대통령이 선거운동 중 한반도 주변의 중, 일, 러, 미국 등 4개 강국과 같은 수준으로 인도와의 동맹을 강화하겠다고 약속했으며 2017년 집권 후 모디 총리와의 만남을 열정적으로 추진해왔음은 물론, 경제적 불확실성의 시대에 외교적 다양화가 필요하다는 인식 아래 미국과 중국의 줄다리기가 팽팽한 지역에서의 위험을 회피하고 한국과 인도가 함께 미래의 요구를 충족시키기 위한 정책을 꾀하고 있다고 전한다. 거슬러 올라가면, 노무현 대통령의 2004년 인도 방문이 평화와 번영을 위한 장기적 협력 동반자 관계를 수립한 이래 양국의 자유무역협정이 시작되기 위한 길을 텄다. 이후 문재인 정부는 전략적 이해와 문화적 협력 그리고 민간 협력을 강조하며 인도와의 협력 확대를 추진하고 있다는 것이다. 특히 모디 총리는 2015년 한국을 방문해 동방정책을 소개함으로써 양국관계를 특별 전략적 파트너십으로 상승시켰으며, 당시 한국정부는 100억 달러를 인도의 사회적 인프라 설립을 위해 제공하기로 동의한 바 있다. 문대통령은 한국과 인도의 관계를 강화시키고자 힘써 왔으며 정동채 전 문화부 장관을 인도에 특사로 파견하기도 했다. 이후 지난해 11월에 공식적 정책발표가 이어졌으며 아세안 3개국 순방동안 인도와의 관계 증진을 목표로 한 신남방정책을 통해, 인간이 중심이 되며 평화를 사랑하고 상호 번영을 가져올 공동체 건설을 위한 3P비전을 설명했다. 올 2월 국립외교원은 외교안보연구원 내에 아세안-인도센터를 열었고, 정책의 이행과 발전을 위한 제도적 틀을 갖추는데 힘쓰고 있다. 다음은 뉴스프로가 번역한 디플로마트 기사 전문이다. July is the month when the monsoon rains finally reach India’s shores, bringing with them relief and prosperity. This year they shall be accompanied by an unlikely companion: South Korean President Moon Jae-in, who will be in India for a four-day state visit starting July 8. This long-overdue visit comes at a time when the geopolitical landscape of Northeast Asia is evolving due to shifting dynamics on the Korean Peninsula, not to mention India’s own general election in early 2019. Despite internal and external pressures, and amid uncertainty over regional activities, both countries seem to have understood that a summit meeting should come sooner than later. Much like a good monsoon. 7월은 우기의 비가 마침내 인도 해안에 도달하며 안도감과 번영을 가져다주는 달이다. 올해의 비는 흔치않은 동반자를 동반하게 되었다. 바로 7월 8일부터 4일간 인도를 국빈방문할 한국의 문재인 대통령이다. 진즉에 있었어야 할 이 방문은 2019년 초에 있을 인도의 총선뿐 아니라 한반도의 변화하는 역학으로 인해 동북아의 지정학적 지형이 변하는 시기에 이루어진다. 내외부적 압력과 지역의 상황으로 인한 불확실성에도 불구하고, 두 나라는 정상 회담을 곧 해야 한다고 이해한 것으로 보인다. 좋은 열대성 폭우처럼. The Moon-Modi rendezvous has been keenly sought since the early days of the Moon administration, which came to power in May 2017. During the election campaign, Moon pledged that he would elevate ties with India to the level of Korea’s relations with the four major powers in and around the Korean Peninsula – China, Japan, Russia and the United States. This is a significant departure from Korea’s traditional foreign policy, and is a timely, even necessary, development. A pressing need for diplomatic diversification in the age of escalating geopolitical as well as economic uncertainty is the rationale behind Moon’s ambitious move. It is partly a hedging strategy amid the U.S.-China tug-of-war in the region, and partly a forward-looking move to address how Korea and India can together meet the demands of a dynamic future. 문재인 대통령과 모디 총리의 만남은 2017년 5월 집권한 후 문재인 대통령의 정권 초기 이래로 열정적으로 추진되어 왔다. 선거 운동 중, 문재인은 한반도 주변의 중국, 일본, 러시아, 미국과 같은 4개의 강국과 맺은 관계와 같은 수준으로 인도와의 동맹을 강화하겠다고 약속했다. 이는 한국의 전통적인 외교 정책으로부터 중대한 변화이며, 시의적절하고 심지어 필수적인 발전이다. 점점 커지는 지정학적, 그리고 경제적 불확실성의 시대에 있어 외교적 다양화가 긴박하게 필요하다는 것이 문재인 대통령의 야심 있는 행동의 이유이다. 이는 부분적으로는 미·중 줄다리기가 한창인 지역에서의 헤징전략이며, 또 한편으로는 한국과 인도가 어떻게 함께 역동적인 미래의 요구를 충족시킬 수 있을지 대처하기 위한 미래를 향한 움직임이다. This will not be the first time South Korea extends its hand to India. South Korean President Roh Moo-hyun’s 2004 visit to India resulted in the establishment of the “Long-term Cooperative Partnership for Peace and Prosperity,” which paved the way for the start of bilateral Free Trade Agreement (FTA) negotiations. After years of close economic ties, the Moon administration is now gearing up to expand its cooperation with India with equal, if not more, emphasis on strategic understanding, cultural appreciation, and people-to-people engagement. Such optimism is not one-sided. Modi has been religiously promoting his “Act East Policy,” which accompanied the prime minister during his visit to Korea in 2015, when both countries elevated bilateral ties to a “Special Strategic Partnership,” and the Korean government agreed to provide $10 billion to support India’s priority infrastructure sectors. 한국이 인도에 손을 뻗치는 것이 이번이 처음은 아니다. 한국 노무현 대통령의 2004년 인도방문은 “평화와 번영을 위한 장기적 협력 동반자 관계”의 설립을 낳았고 이는 양국의 자유무역협정이 시작되도록 길을 닦았다. 수 년간의 간밀한 경제적 관계 후에, 문재인 정부는 전략적 이해, 문화적 협력 그리고 민간 협력을 더 많이 혹은 최소 같은 정도로 강조하며 인도와의 협력을 확대시키려 추진하고 있다. 그런 긍정적인 감정은 한쪽만 가진 것은 아니다. 모디 총리는 양국이 양국 관계를 “특별 전략적 파트너십”으로 상승시켰던 2015년 한국 방문 당시 소개했던 “동방 정책”을 열성적으로 추구해왔으며, 당시 한국 정부는 100억 달러를 인도의 우선순위인 사회기반시설 분야를 지지하기 위해 제공하기로 동의했다. Moon’s commitment to the strengthening of Korea’s ties with India has been clear since he took office. Early on, Moon sent a Special Envoy, former Cultural Minister, Chung Dong-chea, to India to explain his diplomatic vision and deliver his wish for enhanced bilateral relations. This was followed by the official announcement of the policy in November last year. During his tour to three ASEAN countries, Moon outlined his “3P” vision to build a people-centered, peace-loving and mutually prosperous community through the New Southern Policy aimed at boosting ties with India as well as ASEAN member countries. Soon after, one of Moon’s foreign policy aides, Shin Bong-kil was dispatched as an Ambassador to India, a post traditionally occupied by career diplomats. The Korean National Diplomatic Academy opened the ASEAN-India Research Centre within its Institute of Foreign Affairs and National Security in February this year, and the government is currently working on an institutional framework that will oversee the development and implementation of the policy. 한국과 인도와의 관계를 강화시키고자 하는 문 대통령의 의지는 취임한 이후로 명백했다. 집권 초기에 문 대통령은 자신의 외교 비전을 설명하고 상호관계증진을 바라는 자신의 소망을 전달하도록 정동채 전 문화부 장관을 인도에 특사로 파견했다. 그 이후 지난해 11월에는 공식적인 정책 발표가 이어졌다. 아세안 3개국 순방 동안, 문 대통령은 아세안 회원국들뿐 아니라 인도와의 관계 증진을 목표로 한 신남방정책을 통해 인간이 중심이 되며 평화를 사랑하고 상호 번영을 가져올 공동체 건설을 위한 “3P” 비전을 설명했다. 이에 이어서, 과거에는 보통 직업 외교관이 임명되던 인도 대사직에 문 대통령의 외교정책 보좌관 중 하나인 신봉길이 파견되었다. 국립외교원은 올 2월에 외교안보연구원 내에 아세안-인도 연구센터를 열었고 정부는 그 정책의 이행과 발전을 관장할 제도적 틀을 갖추게 하는 데 현재 전력을 다하고 있다. South Korean President Moon’s maiden visit to India will reinforce his abiding commitment to the country, fortifying a historical partnership that dates back over 2,000 years. The two countries are expected to forge closer political and defense ties and to make tangible headway in advancing Korea’s $10 billion assistance towards the development of India’s infrastructure. They are also expected to reach an early harvest agreement on upgrading the Comprehensive Economic Partnership Agreement (CEPA), and to enhance cooperation in various areas, from technology and cybersecurity to tourism and culture. 한국 문재인 대통령의 인도 최초 방문은 2,000년 넘게 거슬러 올라가는 역사적 동반자관계를 견고히 하면서 인도에 대한 그의 변하지 않는 의지를 강화할 것이다. 양국은 밀접한 정치적이며 방위 관련된 유대관계를 구축하고 인도의 공공 기반시설의 발전을 위해 한국의 100억 달러 지원을 추진하는데 있어 눈에 보이는 진전을 이룰 것으로 기대된다. 양국은 또한 포괄적 경제 협력자 협정을 한 단계 격상하기 위한 조기 성과 협정에 도달할 것이며, 테크놀로지와 사이버보안으로부터 관광산업과 문화에 이르기까지 다양한 분야에서 협력을 증진시킬 것으로 기대된다. India’s expectations for the visit will be shaped by its growing global footprint, and its desire to invest in relationships in the region that help avoid polarizing confrontation. Modi will also look to Korea to continue his pitch for inviting foreign investment and cooperation, especially in large-scale infrastructure projects and heavy industries such as defense and shipbuilding. 이번 방문에 대한 인도의 기대는, 자국의 성장하는 세계적 영향력에 의해, 그리고 그 지역에서 양극화의 대립을 피하는 일에 도움이 될 국가 관계에 투자하고자 하는 자국의 바램에 의해 그 모습이 형성될 것이다. 모디는 특히 대규모 공공기반시설 프로젝트와 방위, 조선 등의 중공업에 있어 외국인 투자와 협력을 유치하고자 하는 지속적인 노력의 일환으로 한국에 기대를 걸 것이다. This year, farmers in Orissa may have put their faith in amphibian matrimony to appease the monsoon gods. 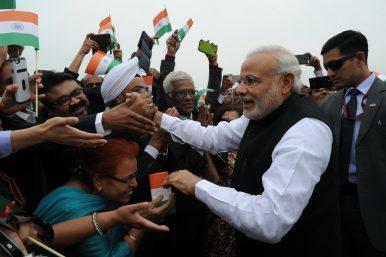 However, to make a success of the Moon-Modi summit requires no divine intervention. For the hundreds of millions of Indian households which already regard South Korean companies such as Samsung and Hyundai as no different to home-grown names such as Reliance and Tata, the forthcoming state visit is an opportune moment for Moon’s people-, peace-, and prosperity-focused vision to find favor in the hearts of 1.3 billion Indians. 올해, 오리사 주 농부들은 우기의 신들을 기쁘게 하기 위해 개구리의 결혼에 빌었을지 모른다. 그러나, 문재인-모디의 성공적인 정상회담을 만들기 위해서는 신의 중재는 필요치 않다. 이미 수백만 명의 인도 가정에 있어 삼성 현대와 같은 한국기업들은 릴라이언스 혹은 타타와 같은 인도 기업의 이름과 별반 다르지 않으며, 다가오는 국빈방문은 사람, 평화, 번영에 초점을 맞춘 문 대통령의 비전에 대한 호의를 13억 인도인들의 가슴 속에 심어줄 적절한 기회가 될 것이다. Soyen Park, a Korean national, is an independent researcher based in New Delhi, India. Ramandeep Singh, an Indian national, is a PhD candidate at the University of Cambridge, England.